why you should interview your fiancé before you ever hire your wedding photographer. this morning I received an email from a desperate bride. I am sad to say this is not the first time an email like this has come across my desk. it was something along the lines of her wedding day is fast approaching and she is about to fire her current wedding photographer! WHAT?! I know, everyones worst nightmare! and I am speaking about all parties involved! she had made a quick decision, and now is trying to fix it. I get it. it’s easy to get caught up in the romance of the wedding planning process and the overwhelming check list & just go with what “works” at the moment to move onto the next thing. she said she had reservations in the beginning, but her fiancé liked the photographer & she wanted him to “be happy too”. she mentioned that she wasn’t sure about the photos when viewing their portfolio but thought maybe hers would be different. when she recieved her engagement photos back, she knew that she was going to regret her decision if they didn’t make a change before the wedding took place. TALK ABOUT STRESSFUL & EXPENSIVE! naturally, I have some thoughts about this which leads me to writing this little blog post. why you should interview your fiancé (read talk to each other) waaaaay before you hire your wedding photographer! What feeling do we want to have at our wedding? What do we want our guests to experience? Do you want a more formal setting/feeling? Or more relaxed, and your focus is to allow your guests to have a good time and just let the day flow with no real agenda? What do we plan to do with our wedding photos & what do we hope to have at the end of the wedding? Do we want to hang up photos of us looking all glam & posed? Do we want to create an album that really shows the full timeline from beginning to end? Are you nervous about getting photos of yourself taken? Do you want to have set time for portraits where there is some privacy & more time to get comfortable? Is having an engagement session to get used to working with the photographer important so we can feel better before the wedding? Have you seen any photographers work that you like? What is it about their work that you were drawn to? 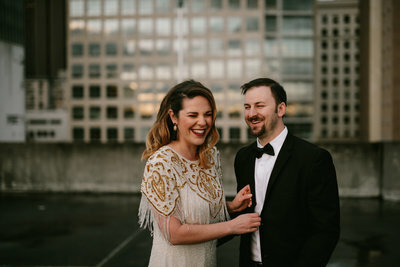 As you start to ask these questions to each other, I will give you my thoughts, and help guide to the person you might want to hire as your photographer and what to look for when you talk to them! 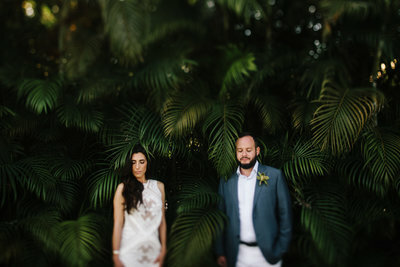 The feeling you want at your wedding…..
// if you are after a formal full day where every minute is planned, you need to be looking for a photographer who has had experience shooting multiple weddings in their career, let’s say 40+ weddings. They’ve seen things go wrong, how to think on their toes & calm your nerves. They have back up gear for their backup gear. They know how to anticipate what’s coming next, and they are prepared. They know how to keep a big group on schedule, how to make adjustments to make up for timelines that fall behind (basically every wedding runs late), they can tackle a family group shot list in 25 min or less, and still grab table details before guests move in for dinner. They are confident in their skills & lighting situations. They are a team player & work well with any vendors. You took the time to plan it out, and knowing you will be taken care of let’s you then enjoy your day! When you view their portfolio you see a full range of photos from beginning to end. You see lots of details, formal photos, photos in natural light & flash. // if just reading the above makes you anxious, then maybe you’re after something a little more laid back. you have a timeline, but it’s just so people know when to show up. you don’t care about traditions, just want the ceremony to flow into the rest of the evening & let yourselves take it all in. you want a photographer who takes a more photojournalistic approach. they feel comfortable with the flow of a wedding, and what happens. they can direct but then step back. they can grab moments quickly & anticipate what’s coming. they have experience with weddings, but they may not have as much experience as the above photographer. When you view their portfolio you see again a full range of photos but there may be less “camera aware” and more moments, the setting & candids. Natural light and flash images should be seen as well. 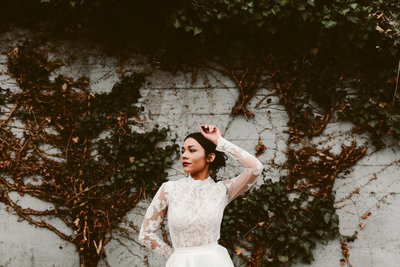 What do we plan to do with our wedding photos…..
// you may have answered all of the above, & my hope is that is what all my clients would say. I love editorial vibes and creating with my couples. When I build a timeline, I am working in 1-2 hours of portrait time if allowed. I want to give them photos of themselves where they can’t wait to frame and put them on their wall. if this is also a goal for you two, then working with a photographer who knows how to pose and work with light & variety of locations giving you images to choose from is important. 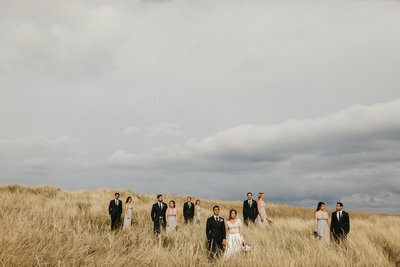 if you also want to create a photo album later, then make sure that you have seen previous work where they also pay attention to details, guests, moments, and catching the full timeline of the day so when you create (or they do) your album, you have enough options to choose from that really showcase what took place. You want to be able to show your grandkids your wedding album one day, and you want to actually be able to relive those memories! // it’s so natural to be nervous. everyone says “we aren’t good in front of the camera”. this is where connecting with your photographer is SO IMPORTANT! Do they put you at ease? Do you get to meet with them before your wedding to get to know them? Do they offer engagement sessions to get to know how they work, and have a chance to get used to be in front of camera without the pressure of it being your wedding day? Your photographer spends almost the whole day with you, make sure you like hanging out with them too! What is it about their work that you were drawn to? Be picky. Ask questions. Have a conversation. Don’t hire someone just because they shot your friends wedding. Hell, i remember I purchased a pair of jeans that looked bomb on a friend and she raved and raved about how amazing they were…..guess what, I hated them for myself. Okay, yes, who you hire is different then buying a pair of jeans, but you get my point. YOU have to fall in love with what FITS YOU TWO! and it’s not one size fits all.